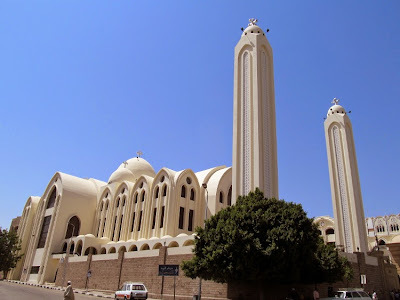 That photo of the Coptic Cathedral of Archangel Michael was taken when I visited Aswan in Upper Egypt last year. In her book Sufism, Mystics and Saints in Modern Egypt Valerie J. Hoffman describes how the Sufi spirituality of Islam has much in common with Christian Coptic spirituality. In a post last year I described how the Copts believe they are the direct descendants of the Pharoahs, and how the Coptic Church practices not only the oldest Christian music, but also the oldest music in the world. A chain of transmission links the Coptic Church to the Hermetic tradition and the teachings of Hermes Trismegistus. The Hermetic tradition has many links with music; these start with Michael Maier in the 16th century, and burgeoned in the late 19th century to embrace notable figures including Edward Elgar, Rutland Boughton, John Ireland, and Eric Saite. Satie's repetitious Vexations was an influence on John Cage, and the repetitious Sufi-inspired music of Hamza El Din from Nubia - now Upper Egypt - influenced American minimalists including Terry Riley, while the wider influence of Sufism can be found as far afield as Wagner and Jonathan Harvey. Classical music is not a simple one-size-fits-all art form. It is a complex syncretic artform that in the single paragraph above extends from Coptic chant to John Cage. But the classical music establishment refuses to acknowledge this complexity and diversity, and instead remains wedded to the one-size-fits-all strategy that last year gave us 24/7 Britten, this year 24/7 Richard Strauss, and next year will give us 24/7 Sibelius. New personalised digital delivery platforms mean audience behaviour has changed, but the music establishment hasn't. Orchestras still believe they are in the concert promotion business, classical radio stations still believes they are in the programme production business, and record companies still believe they are in the music recording business. Whether we like it or not, the only music industry sector that has it right is the new technology sector. Because Spotify, iTunes and others have leveraged digital technology and become personalised music delivery services. Forget about concert promotion, radio programme production and music recording business being discrete industry sectors. Because digital technologies mean that today everyone is in the music delivery business. And, as a result, everyone is in competition with everyone else. The problem is that the music establishment hasn't woken up and smelt the coffee. Orchestras still see other orchestras - our Mahler is better than their Mahler - as the only competition. Classical radio stations still see other classical radio stations - our programmes have more listeners than their programmes - as the only competition. And classical record companies still see other record companies - our CDs sell more than their CDs - as the only competition. While, all the time, orchestras, radio stations and record companies are haemorrhaging audience to the new personalised music delivery services. The solution is not to bolt new delivery technologies on to tired legacy formats. That is what orchestras and record companies are doing by jumping on the streaming bandwagon. Bored by Mahler in the concert hall and on CD? - now you can also be bored by his music in the airport departure lounge. That is what classical radio has done with on-demand streaming. Bored by bland radio programmes? - now you can be bored by them for a second time. To survive orchestras, radio stations and record companies need to acculturate and serve an audience that demands personalised, specialised and fragmented music delivery. When did you last go to a concert, listen to a radio programme or look at a CD release schedule that mixed Coptic Chant, Nubian Sufi music, 16th century Rosicrucian music, Elgar, Wagner, Satie, Cage and Jonathan Harvey? Am I being hopelessly idealistic? Not all all: because that mix is on my personal playlist, and similarly eclectic mixes are on millions of other personal playlists. Which is why the audiences for concerts, classical radio and CD/downloads are in decline. How long can classical music ignore the glaringly obvious? Yep, those are the issues. I don't much like your solution - my tastes are very broad but I don't mix them up in playlists. Once my head is in a genre (I'm right now listening to acoustic blues) I prefer to stay there a while. Still, your suggestions should be tried. The current recipe isn't working so there needs to be many experiments.